Zhang Weiliang is charming musician who got both of composing and performing skills. 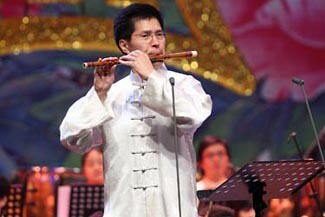 Being good at Dizi, Xiao and Xun, Zhang is known as “The King of Flute”. He has published a lot of CDs, such as ” Tears of Flower”,” Infatuation for Dizi” , ” The World of Xiao”, “Dying Young”, and “Of Heaven and Earth” for Xun. As a Dizi instructor, Zhang tries to combine his personal experiences into instructing and practicing. and some of his students has awarded in China and overseas competitions. Also, his books and papers won a high reputation in related fields. There are many Chinese newspaper published his interviews, such as ” People Daily” , ” China Daily ” , ” Guangming Daily” , “Beijing Daily” ,” China Youth Daily”, “People’s Music” and ” Music Weekly”. Also, “The European Times” and “The Independent” had reports about him and called him as the most contributive person for Dizi performing arts’ development. This song is from Dizi player Zhang Weiliang. The song appeared around Ming dynasty. It describes a picture that a group of wild geese alight on sand and the melody of song is elegant and graceful.